The non-profit research arm of Lloyd’s of London, Lloyd’s Register released the fourth, 2018 edition of its Technology Radar this week. Entitled, “Renewable Energy: Towards the tipping point,” it’s the second consecutive edition of the global report that zeros in on global, low-carbon energy investment and growth. “Which technologies are likely to have the greatest impact in different countries?”. The study goes on to highlight the key drivers and inhibitors for success. Substantial hurdles remain, however; and it may take longer than renewable energy advocates expect, or would like, for renewable energy to displace fossil fuels as the main source of electrical power generation worldwide, according to the report. Technological advances are seen as the most significant, positive agent of change, while hurdles and barriers revolving around the slow pace of energy storage project development and inertia surrounding energy policy and economic thinking are considered the most significant obstacles. 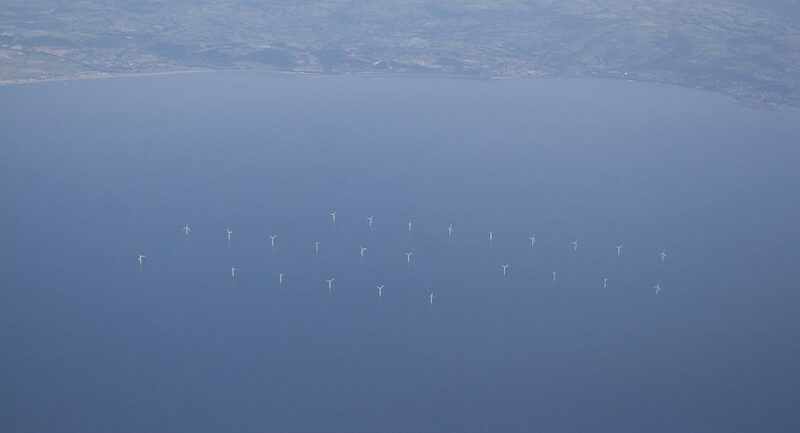 “Our latest Technology Radar – Renewable Energy research reflects the most current and forward-looking attitudes, actions, and investment behaviors in both global and local renewable energy markets,” Alasdair Buchanan, director of Lloyd’s Register’s Energy business, said. Respondents expect grid parity for solar to be achieved first in China (2022), followed by Spain and UAE in 2024, and by Australia and the US in 2025. For wind power generation, grid parity is expected in Germany and UK by 2024, USA and Denmark in 2025, and in Sweden by 2033. Although a minority of respondents (10%) believe that renewables have already overtaken fossil fuels in their country, or will do so in the next two years, 58% believe that this milestone will not be reached until after 2025. Renewable economics are unquestionably improving, but 62% of respondents say that high development costs remain the primary argument against pursuing renewables in their country. However, the cost of building solar capacity for utility-scale generation has more than halved in the past 10 years, which has helped to fuel the rapid expansion of solar capacity worldwide since 2014. More than 45% of the surveyed executives (including 55% of those based in Europe) say that resistance to onshore wind turbines in their countries is too strong to enable significant growth from this source. An overwhelming 71% agree that technology advances will do more in the next five (5) years to improve the economic case for renewables than policy or regulatory changes. There is an expectation for advanced metering infrastructure (AMI), demand response management (DRM) systems, networked sensors and accuracy of asset monitoring data to have a beneficial impact on operational performance. However, 36% identify policy inconsistency as an inhibiting factor. 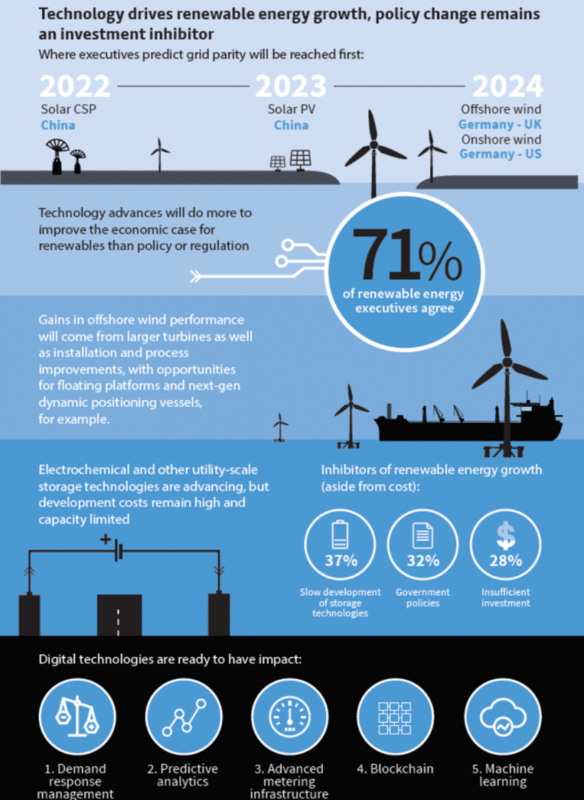 37% of respondents indicate the slow development of storage technologies as the most important factor inhibiting the growth of renewables in the energy mix. Utilities need to be able to call on energy producers for additional power whenever it is required, whether for load balancing or meeting surges. Green hydrogen provides an alternative form of storage to electrochemical batteries as hydrogen fuel cells can store power for considerably longer. 42% of respondents agree that reaching grid parity will not be enough to cause a sustained increase in investment in renewables. Subsidies are critical to support developments in most markets. In producing the report, Lloyd’s Register “sought the insights and opinions of leaders across the sector, as well as a survey of 800 professionals and experts around the world.” That included surveying respondents from organizations spanning the renewable energy value chain, traditional energy companies with renewable energy assets or activities among them. Conducting the survey on behalf of Lloyd’s Register, Longitude Research queried respondents representing power and utility companies with renewable energy assets (58% of the sample), energy companies with renewable energy assets (excluding utilities and power generation) (21%), and oil and gas companies with renewable energy assets or activities (21%). Twenty-eight percent of respondents are based in the Americas, 24 percent in Europe and 23 percent in Asia-Pacific. The remainder are based in the Middle East and Africa. The survey also spans energy sector participants of various sizes. One-quarter of respondents work in companies with less than $50 million in annual revenue and 46 percent in companies earning between $51 million and $500 million a year. The remaining 29 percent work in energy sector companies with annual revenue above $500 million. In the executive summary, Lloyd’s Register report authors highlight that the shift from fossil fuel and other conventional energy resource investment and use is proceeding at different rates across the worldwide community of nations depending on numerous, varied factors. “[W]hilst this is a global challenge and the end goal is universal, the solutions are not uniform. In fact, the best energy ecosystem for any given country depends on a set of characteristics that are specific to that nation – including the natural resources available, geo-demographics, energy demand, market design, policy, technology, public appetite and social acceptance.